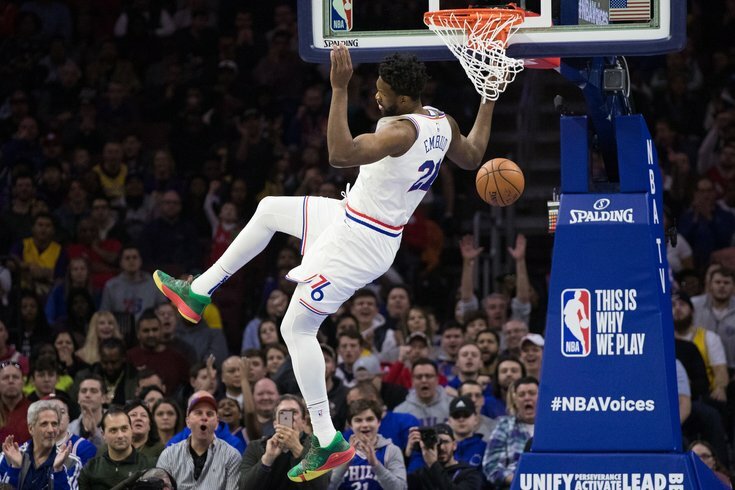 Philadelphia 76ers center Joel Embiid (21) dunks against the Los Angeles Lakers during the first quarter at Wells Fargo Center. Two games into the Tobias Harris era, the Sixers already have the makings of a legitimate title threat. They have things to clean up and roles to settle into, but the Sixers beat the Lakers quite comfortably on Sunday afternoon, earning a 143-120 win in a national showcase game. With Joel Embiid and Harris leading the way, the Sixers were able to coast to the finish despite a huge night for Lakers forward Kyle Kuzma. • Tobias Harris fits like an absolute dream in Philadelphia. With Harris in the starting five, the Sixers can force mismatches all over the floor, and he's going to win almost every time if he can get a bigger player switched onto him. He made JaVale McGee look like he was running in cement in the first quarter, blowing by him on several drives for layups or dunks. That's the sort of thing you should expect out of him on a regular basis, regardless of whether his shooting success comes and goes. Brett Brown deserves some credit for giving Harris some freedom within the offense to run what he's good at as he settles in with his new team. Harris is already running a decent amount of pick-and-roll with the Sixers, and the Sixers are benefitting from letting the talent dictate how the game is played. The Sixers' overall structure remains in place, but they can only benefit from adding more wrinkles to the offense. • Joel Embiid had one of his worst offensive games of the season against the Nuggets on Friday. He was not about to turn in a repeat of that performance in a Sunday showcase game against the Lakers. The Lakers offered absolutely no resistance to Joel Embiid regardless of who was on the floor. Tyson Chandler was brought in midseason to help solidify the Lakers' paint defense, and Embiid made the poor guy look like his next team should be for a retirement home. Even with the Lakers sagging off of Embiid at times, he had no trouble Euro-stepping around them or finding pockets of space for easy layups and dunks. This dude lives for games against the Lakers and you can't tell me otherwise. But with Simmons chasing the game a little bit, the Sixers needed Embiid to dominate and play under control. He was the best version of himself, and the driving force behind their comfortable win. Ben Simmons taking a three damn near sent the media into hysterics (and I'm sure that applies to many of you at home, too). None of us were even really sure what happened, to the point that we had to check the monitors to make sure that was indeed what happened. In normal circumstances, no one gets celebrated for just taking a three, but if teams are going to leave him alone like that, he has to do this more often, preferably not just because his mentor is egging him on. • JJ Redick has denied this is the case, but he sure is playing like he wants to remind the basketball universe that he is an integral piece of this starting five. I think his skill level gets a bit undersold at times, because people have grown so accustomed to what he brings to the table. One play I'm thinking of in particular: he caught pass from Simmons in transition on a dead sprint in the second quarter, went up and took the shot while still moving, and drilled it despite being fouled in mid-air. The degree of difficulty on a play like that is hard to overstate. • Nothing fancy from Mike Scott on Sunday afternoon, but I think he gives them some needed toughness and edge that'll serve them well in a playoff series, even if his jumper escapes him. The Sixers upgraded their talent over the last week, but I think they also brought in some guys who are not going to back down from a fight. That'll serve them well. • Credit to Furkan Korkmaz for responding to the call post-deadline. With a chance to fight his way back into the rotation, he has made a bunch of effort plays over the last couple games, playing active defense off-the-ball and crashing the glass for offensive putbacks. I doubt you're going to be able to lean on him in a playoff series, but all he needs to do is bring this same energy every night and it'll help bridge the gap between Philly's star-laden lineups. • I can't wait to see what the energy is like in this building for Sixers vs. Celtics on Tuesday. That's going to be fun. • I take less issue with how Simmons approached this game than some others will. The Lakers showed him absolutely no respect as an offensive player, with LeBron James sagging all the way to the free-throw line and daring him to do something. Simmons missed a bunch of shots around the basket, and I think you encourage him to keep attacking. Put it this way: I'm not going to be the guy who asks for Simmons to be more aggressive and then turn around and say, "But not like that!" when he answers the bell. I also thought his on-ball work against James was excellent, with James struggling to find his rhythm all night. Only real complaint I have is regarding his off-ball defense early in the game. Kyle Kuzma was able to get going early against the Sixers in part because Simmons just abandoned his assignments on defense, drifting toward the paint with no real plan. I can understand when the new guys botch switches, that's part of adjusting to a new offensive system, but Simmons should be much better there. Even still, he made an impact on the defensive end of the floor and was a big part of why the Lakers were never able to get back into the game in the second half. • I'm not sure whether to give Jimmy Butler credit for playing unselfishly or worry that he continues to pass up some very makable looks. As I said following the Denver game, these are the sort of problems that you live with, and the Sixers killed L.A. in Butler's minutes on Sunday. I do wonder if there's going to be a breaking point for this style of play, and the Sixers are definitely going to need more attack-mode Butler. But if they're playing well and winning? Let it rock. • James Ennis has played hard and will be fine as a role player here in Philly, I think, but he had a couple layup attempts that I'm sure he's going to want back. Had he just gone up strong, he probably could have avoided a pair of first-half lowlights.